The Ashworth Cardiff shoe was quite a popular choice amongst readers of The Hackers Paradise, so when news spread about a new version coming soon, the excitement level rose a bit. 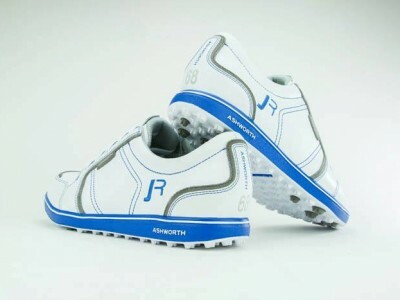 Ashworth Golf, an authentic golf brand dedicated to bringing modern style to the golf course, has announced the release of the new Cardiff ADC spikeless golf shoe to its expanding portfolio of versatile golf footwear. Available in men’s and, for the first time in the company’s history – women’s models, the new Cardiff ADC has been redesigned to deliver enhanced comfort, functionality and the performance of a traditional golf shoe with the revamped styling and versatility of a casual shoe. To maximize all-day cushioning and comfort, the Cardiff ADC features a premium redesigned leather upper, advanced comfort last and super-soft polyurethane sockliner on a poured PU midsole. To maximize performance, the Cardiff ADC’s new spikeless outsole was recreated to deliver even more stability and traction in both dry and wet conditions with new strategically-placed traction lugs designed to deliver optimal grip both in varying conditions and surfaces. The soft and pliable molded rubber outsole provides a more flexible, low-profile fit without the sensation of traditional spiked models. Backed by a two-year waterproof warranty, the men’s leather Cardiff ADC will be available in six colorways: Collegiate Navy/Airforce Blue/Pebble, White/Neutral Grey/Airforce Blue, Brown/Dark Brown/Fairway and Black/Cardinal/White available on September 1, 2013 and White/Dark Grey/Fairway and Neutral Grey/Dark Grey/True Red available on March 1, 2014 with an MSRP of $120 USD. The women’s leather Cardiff ADC will be available in four colorways beginning September 1: New Navy/Khaki/Bordeaux, White/Light Aqua/Airforce Blue, Light Khaki/Khaki/Spring Green and Black/Dark Orange/White with an MSRP of $120 USD. I like the color ways by the descriptions. Approaching that price where they would have to be extremely comfortable to get me out of the Ecco’s though. I have loved the Adidas Adicross spikeless. I hope to try a pair of these. The full waterproofing will be a definite upgrade! I can’t wait to see a pair of these up close, the new color combinations sound great, I hope they look as good as they sound. I have two pair of the adidas adicross spikeless shoes and do enjoy them. I really like the look of this shoe and the color choices are very good. I have really enjoyed the Ashworths’ that I own now and will have to check out these when they are released.